TWCA is excited to partner with Virginia Tech to bring you the 2019 Field Day! With guest speakers, new trials, and the ribbon cutting for TWCA's newest Rainout Shelter (ROS) it promises to be a great event! 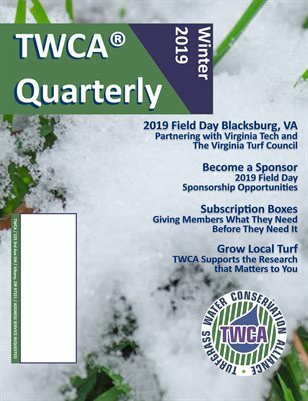 ​Founded in 2010 by direct competitors in the turfgrass industry, the Turfgrass Water Conservation Alliance (TWCA) is a 501 c(3) non-profit committed to water conservation. We believe that by improving the plant materials available we can reduce the water needs of the managed environment while preserving the vital ecological services provided by green spaces. Our science based approach to conservation relies on the 3rd party peer review of objective data to qualify only those turfgrasses that demonstrate a statistically significant water saving potential over conventional varieties of the same species. By testing with research collaborators in locations across North America, the TWCA eliminates confounding factors such as soil type, heat, and pest management from the results. Our more than 150 members world wide represent the green collar industry; government agencies, and academia. The TWCA continues to grow and emphasize the importance of a balanced, scientifically based approach to conservation and the managed environment.